This week I once again decided to try to delve into a Ghostbusters comic though I have only ever read one other issue that IDW has put out. My first thoughts were that the story is interesting but hard to jump right into without reading what has come before this. There was a recap page but it really just glossed over what has already happened in the life of the Ghostbusters and the people in their lives since the book started under the IDW banner. It is however clear that Ray, Winston, Peter, and Egon have been very busy since they were last seen on the big screen. They even make a mention to having a Chicago branch of the company. The story for the most part is pretty interesting. The Buster’s are called into a U.N. building to take care of a ghost for an ambassador and are soon approached by another who claims to need their services and even offers to pay the bill for the ghost that they have just gone after. During the meeting the constant thorn in the Ghostbusters side Walter Peck shows up to represent the city of New York in the deal that is being made. And as usual ends up being put in his place when the generous benefactor announces that he would like to purchase the Ghostbuster company. Burnham really has the voices of the character’s down. None of them come off as acting or speaking out of character. But the highlight of this book to me is the art of Dan Shoening. 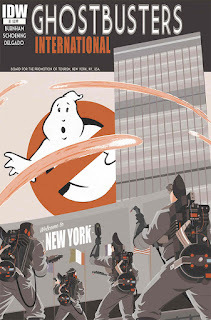 it captures a nice mix of the movie and cartoon versions of the Ghostbuster characters. And his cartoony style also serves to make the book a lot more fun. I probably won’t be grabbing more single issues of this, but I am intrigued enought to want to find and read some of the earlier IDW Ghostbuster titles to read them from the beginning to see how it got to the place it is currently at.